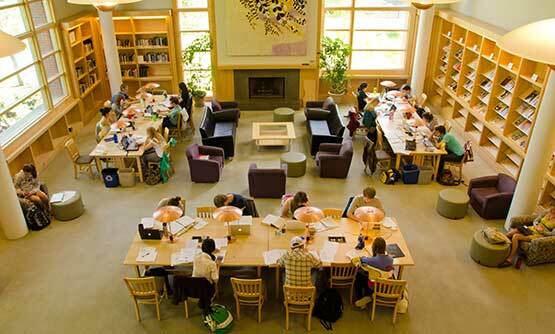 The Allen Reading Room Challenge has become Whitman folklore. “Winners are encouraged to celebrate through song or dance before leaving,” states the final rule regulating the Allen Reading Room Challenge. In the friendly competition, the last Whitman student to leave the quiet study room in Penrose Library, open 24 hours, has the honor of signing the library logbook. Because the final student, amped on caffeine, often departs at an unconscionable hour after pulling an all-nighter, the messages scribbled onto the pages of the notebook sometimes contain ramblings rather than profound revelatory truths. “Want to know a secret? I totally take dance-on-the-couch study breaks when it's just me in here,” wrote one student at 5:15 am. While dancing on a couch might revitalize weary students, the Allen Reading Room, named in recognition of a gift from the Paul G. Allen Charitable Foundation, is the spot on campus where students understand they can study surrounded by total silence. The room became the quiet study space after Penrose was renovated in 2000. Late one night in February 2003, an anonymous, sleep-deprived student created the Allen Room Challenge autograph book to be written in by the last student standing. The many notebooks autographed by the after-midnight winners since the challenge began now form a collection consisting of bound volumes, which are stored in Penrose’s archives. While the snippets scribbled into the notebook might reflect intellectual and emotional growth, the logbook also serves as a sounding board. “Putting off a six-page politics paper until 18 hours before it’s due isn’t one of the smartest things I’ve done in life,” wrote Shelley U at 3:01 a.m.